In this interview Jim Potts talks about collecting petroliana: signs, gas pumps, globes, oil cans, maps, and other items related to gas stations and oil companies. Based in DeSoto, Missouri, Jim can be reached via his website, Oldgas.com, which is a member of our Hall of Fame. I became interested in Petroliana in a kind of roundabout way. I’ve been in the automotive repair business all my life, and have always liked cars and been interested in auto repair stuff. Petroliana is all about gas stations, and gas stations back in the glory days were usually involved with auto repair also. So I felt a kinship with that. I became a serious collector in the mid 1980’s, when my wife got me hooked into a volunteer thing with the kids’ school, making apple butter. They needed mason jars for the apple butter. We put something in the Church bulletin, and the next thing you know we had all these mason jars and some of them were very cool, old looking. I didn’t know anything about them, so I went to the library. I became a collector, and wound up becoming involved in a local organization for antique bottle and jar collectors. I did their newsletter. Within several years I interviewed a guy who collected old oil bottles from the gas station. I visited his house and was totally fascinated. He had old gas pumps, hundreds of glass oil bottles from all these gas stations, and cans, all kinds of stuff. I was just fascinated by it all, and decided, “I’m getting into this.” I’ve still got some mason jars, but I’ve shifted out of mason jars and into petroliana, and have been doing that ever since. Collectors Weekly: Do you specialize in a certain area of petroliana? Potts: I started out kind of collecting across the board. But it’s hard to do that and maintain any kind of a focus. Now there’s a couple of different specializations I’m into. Since I’m involved in auto body shop, and I repair wrecked cars, I started finding things related to that. Old cans of car paint, back from the Model-T days, and the 1920’s and 1930’s, with great graphics, like pictures of the cars on the cans. I’ve probably got 100 of those, old ones from way back when, when people actually painted their own cars with a brush. I also wanted to find an oil company I could really identify with, that was special to me. I selected a local company here in the Midwest, the Zephyr Oil Company, whose headquarters was located about five miles from where I grew up in St. Louis County. The company’s still in business, but they don’t have their Zephyr brand gas stations anymore. It’s really nice when I find something from the old stations. It makes it fun to have a focus of the hunt. I’ve had the most success finding items in three ways. One is going to specialized Petroliana swap meets here in the Midwest. There’s a couple here I can get to in less than a day’s driving. I try to make at least a couple a year, if I can get off work, and I always have pretty good success finding things there. I also find things through eBay. I have a computer program that regularly searches eBay and makes lists of things related to what I’m looking for. And finally, through my website I’ve been able to network with lots of people, so everybody knows what I collect and they can give me tips on items I might be interested in. Its taken a long time for the website to grow and I’ve got tons and tons of pictures that I need to put on, I never have time to keep up. We’ve built an image album for oil bottles, gas pumps, and the gas globes. And there’s a discussion forum, where people can come on and ask if something is a reproduction or not or what part they need to restore this old gas pump. I get a kick out of people being able to find the hard to find items by networking, when some guy in Montana hooks up with a guy in North Carolina. People who wouldn’t be in contact otherwise hook up through the site, and I get a big kick out of that. There are a lot of people out there who collect petroliana, and there are even more people who aren’t dedicated petroliana collectors, but kind of on the edge. For example, a lot of automotive enthusiasts, guys with antique cars and classic muscle cars. They kind of get into it and think “I’d like to have a sign to hang in my garage,” or “I’d like to have a gas pump to put over there.” Some of them wind up falling hook line and sinker and pretty soon they’ve got two gas pumps, and then twelve, and then a whole basement full of signs. 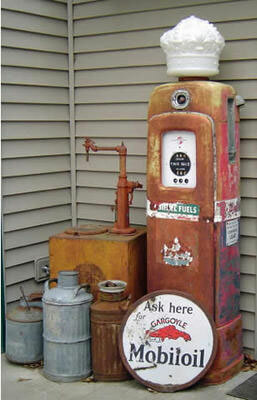 Collectors Weekly: What’s the history of the gas station and gas pumps? Potts: It’s hard to define what a gas station was at first. There were places that sold lubricating oil and fuel oil, but until cars came along, very few places sold gas. Your fuel oil dealer might have sold gas by the can or barrel, or he could pump it into your tank. A lot of drugstores, or general stores, would sell gasoline. But they weren’t really gas stations, as they weren’t dedicated to selling gasoline. Gas stations were few and far between for early car owners, only in metropolitan areas and along certain highways. They were also called on to service cars and most of the time they wound up changing oil and fixing flat tires and all that. It was a perfect place to do those kind of repairs. The early gas pumps were what we call visible gas pumps, with a clear glass cylinder, usually 5 or 10 gallons up on top of the pump. They usually had a real long handle, a manual pump that you’d pull back and forth to pump the gasoline out of an underground storage tank into the cylinder. The cool thing about it was that the buyer could see if the gas was dirty, which was a big problem at that time, or if there was other foreign stuff or water, he could actually see what he was getting. The pump operated by gravity, the gas would flow from the cylinder, which was 8 or 10 feet tall, down the hose into the car. Next came the electric pump, but people still wanted to see the gas, so they had a small cylinder, called a sight glass. There was a little fan inside, and the buyer could see the fan spin as the gasoline moved through the cylinder and came into the car. The very early ones just had a clock face that kept track of the gallons, and then the seller would have to compute the cost in their head (‘well the gasoline costs .16 a gallon, and there’s .4 tax’). Then they came out with computing gas pumps, which would tell you the cost as well. Some of the most collectible pumps are the early pumps with the cylinder on top and the old clock face that keeps track of just gallons, those are very popular now. The later computing pumps were around from the 1930’s into the 1950’s, and then in the 1960’s they modernized them, making them more boxy and streamlined. They kind of lost something for the collectors, they were kind of plain. And they looked alike from company to company. So those really haven’t caught on, although there’s a few that are collectible. Right now the computing pumps from 1930 to 1955 are the ones that guys like the most. The most sought after are the ones from the 1930’s. They had a lot of great art deco styling, were very tall, and had a lot of garnishing and molding and shape, they weren’t just boxy. Collectors Weekly: Aside from pumps, what are the major items that make up Petroliana? Potts: One of the most popular things is signs, especially the old porcelain signs from gas stations. Not only the gas brand signs, but others too. Smaller oil signs. Signs about spark plugs, tires, anything a gas station would sell. Soda pop signs from Coke or Pepsi or whatever. Typically a gas station would have a soda machine. It might have been the only place in that area that had one, or a telephone. It was kind of a community center. Another big item is oil cans, especially the old metal round ones, and the even older squarish rectangle ones. There are people who collect just road maps from oil companies. Oil companies would put out new maps yearly, and they’d change the graphics, which were just wonderful. They’d have great information about the company, a lot can be learned about company history. Another petroliana collectible is giveaway promotional items – gas stations were big on those. It might be an ice scraper with the name of the gas station and the brand. Usually the local retailer had his name on there too. Those can be very sought after collectibles. Then there’s something called a lollipop thermometer, a little plastic thermometer six inches tall shaped like a lollipop. The little skinny part would be the housing for a thermometer, and the big plastic top would be a logo for the gas station. Very similar to the ‘lollipop’ signpost that would be out in front of the gas station. Those things can go for big money these days, and they were just giveaways back in the 30’s, 40’s, 50’s. Yeah, those can be pretty cool. Collectors Weekly: When did people start collecting petroliana? Potts: The first collectors were people that kept the old stuff from grandpa’s or dad’s gas station and then wound up picking up more stuff. They just saved it and stuck it on the shelf for whatever reason, or they just thought it was too cool to get rid of. But the hobby really kicked into high gear, went through a growth spurt probably 20 years ago. That was about the time that things really started to change with gas stations. Fewer gas stations, more ultra modern pumps. The whole business started to change, and the signage started to change. The old porcelain signs would be taken down and internally lit plastic signs would go up. Someone had the sense to go get those signs, and a wave of collectors started up then. Collectors Weekly: Did each gas station have only one company’s brand advertising? Potts: Yes, on average there was just one brand of gas sold per station. But there might be more than one kind of oil at a station. The one major brand, and maybe some other oils too. We have seen a number of vintage photographs showing gas stations selling more than one brand of gas. But we don’t really know for sure if it was really a legitimate practice. Shell and Texaco and Mobil wouldn’t allow that today, but in a rural area, they might have allowed that back then. Practically speaking, did they really have a regular tank and a premium tank for each of those brands underground? They might have had one tank for regular and one tank for premium, and routed each underground to wherever it needed to be and told people it was a different brand. We don’t know. We have no evidence. But we do know that we’ve seen pictures of multiple branded stations. And people really thought, like they do today, that the gasoline was different. “Oh I always burn Shell, I have to burn Shell.” And really, gasoline is just gasoline. It’s a commodity. In terms of brands, Standard Oil was a really big company. The government went after them on antitrust and made them break into several different companies. Standard Oil of New York, which became Mobil. Standard Oil of New Jersey, which became Exxon. And there was ESSO, a play on S and O for Standard Oil. Then of course there was Shell and Philips 66. But some of the most collectible brands are the smaller local and regional ones. Like Signal on the west coast, and Gilmore. There’s a company called Wilshire that sold a brand called Polly, and they had a parrot as their logo. If you can find something from them, even in poor condition, it’s a great find. Especially for collectors on the West Coast. Collectors Weekly: Do collectors usually focus on one brand or collect by item type? Potts: It’s all over the map, there’s a pretty good split between the two. I have a friend who only collects round, 1 quart cans of oil. He has a fantastic collection. He also has 4 or 5 gas pumps and 25 signs, but his main interest is round, 1 quart oil cans. You keep some sanity when you collect like that. Instead of stopping to look at everything at a show, you can train your eye to look for certain things, you can focus. And it’s a little more joyful when you find that certain piece. But there’s also people who just collect anything they can find. They think that’s wonderful. And some of those people turn their collections over on a regular basis. Collectors Weekly: Is there a certain date that collectors tend to stop at? Potts: I’d say roughly 1960, for a couple of reasons. 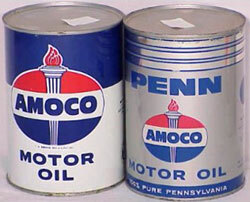 About that time they stopped making all metal oil cans in favor of cans with a metal top and bottom, and a paperboard side. Some people call them composites. They don’t hold up so well, they tend to leak, and a lot of the great graphics were on the older all-metal cans anyway, those are the most collectible. The gas pumps themselves became generic, boxy things after 1960. But at some point, as stuff gets older and harder to find, people will be happy to find stuff from the 60’s or even the 70’s. Collectors Weekly: Who manufactured the pumps… the oil companies? Potts: The pumps were made by separate companies, sometimes specifically for a certain oil company. The Gulf Oil company did this commonly, had different manufacturers make oil pumps styled for them. Sometimes they got a second life after the Gulf station went out of business or was sold. You’ll be stripping the paint off and it’ll be one brand, and then under it is another color with different details. So many old pumps went through several life cycles. There’s a book that lists the companies that made the pumps, and who bought them, and it’s a fantastic number of companies, especially in the 1930’s through the 50’s. There were an endless number of types of pumps depending on the end use. For example, even after computing pumps were available, some didn’t need to compute dollars. I’ve got one in my garage, it was probably at a trucking company or on a farm or a taxicab company, anything that had a fleet or for internal use. They just kept track of gallons. Those pumps weren’t as common because there were a lot more gas stations than fleet operators. Some of these pumps were very plain Jane utilitarian, but some looked just as cool as those at the gas station. Within any given end use, there were plain pumps, ornate pumps, cast iron pumps, steel pumps, a wide range. With cast iron they could create a more ornate shape, using compound curves and hexagons and other ornate curves that would be difficult to do in sheet metal with the technology they had at that time. So they could make a more impressive and more secure piece with cast iron. And because cast iron is so massive, a lot of them lasted because they just didn’t rust through. They were pretty heavy duty, and the sheet metal did rust through. So that’s one of our challenges now, to put them back together. There are quite a number of mom and pop companies that make pieces of various gas pumps, like trim pieces and panels. With some pumps you can buy practically every exterior piece if you’re missing something, and you usually are missing something. That’s one of the great benefits of the popularity of the hobby. 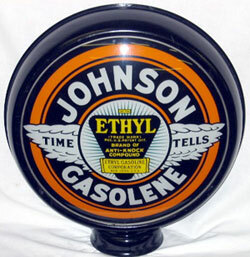 Collectors Weekly: What about the gas globes? Potts: The globes were manufactured by a handful of companies, each styled slightly differently. Some companies used a certain style of frame and had different bodies put into it. So the correctness of your display is that you have the right style and display to hold the lenses in with. That’s not always true when we find them, but that’s something collectors look for. The oil companies would buy the globes and then distribute them to their franchises or people selling their gas. 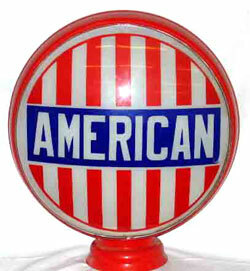 The purpose of the gas pump globes was instant recognition. Lighting wasn’t as good on gas stations as it was today. If your gas station was open after dark, you’d need a light just to operate the pump and fill the tank. Also to advertise that you’re a gas station that’s open. The globe had some glow, but just about every gas pump had some kind of light to light up the whole meter so you could see the meter and gallons. And some of it was very crude. The station’s lighting was sometimes just a single pole with a single bulb, with a little mushroom shade on top. So sometimes all you could recognize when driving by was the gas pump itself lit up, and if the globe on top said the brand of the gas. That was the attention getter. The motorist would know what brand, what kind. So that was standard at gas pumps. Then post World War II, we started getting smaller gas pumps, and no globe. By the 60’s, it was unusual to have a globe. Just a handful kept globes on their pumps into the 70’s, and a very few kept them into the 80’s. Collectors Weekly: What about other globes that aren’t gasoline globes? Potts: Other companies, like phone companies, used globes just because they were available. Some hung them upside down under the awning of a building. Especially at the corners. We’ve seen them for beer, ice cream, barbershops, all sorts of things. Some enterprising salesman said, ‘we’ve already got this standard frame, and whatever you want it to say, we can do it.’ The gas pump globe guys collect those too, because they think they’re cool. The design of globes was a very specialized thing because you had to rethink your colors. With the silk screening process they used, you couldn’t put one color over another, because you’d have a light shining through it. So you had to make your design a limited number of colors, not a lot of tones. You’ll see very few gas globes with any gradient, like just solid colors to an edge. They probably left the actual design to a globe artist, but the logo would come from the advertising company involved with the gas company. Collectors Weekly: What are some of the obstacles facing petroliana collectors? Potts: You can’t find the stuff in your own neighborhood anymore. The guys who collect gas pumps seriously, go cruising. They’d drive country roads all day looking for some old farmhouse with a gas pump by the farm, and they’d stop and ask “do you still use that?” A lot of times they had stopped, because of EPA rules and stuff. And you could buy it from them. But with the price of gas being so high, it kind of cramps the style of guys who want to drive all day. Its hard to go to a swap meet 20 hours away. It shows how far we’ve gotten from the original thing. Collectors Weekly: Any advice for someone just starting out collecting petroliana? Potts: Knowledge is a powerful thing. It’s easy to get taken by spending too much for something, especially a reproduction. There are a small minority who either play dumb or are unscrupulous, and will sell something new like it was old. There are a couple of magazines dedicated to gas station collectibles. One is called Check the Oil, and the other is Petroleum Collectibles Monthly. There are also a number of decent books out there about petroliana collectibles, some highly specialized in just oil cans or globes, for example. There’s a brand-new book out on gas pumps, called The Illustrated Gas Pumps. Anybody who even has the slightest inkling they might buy a gas pump should get it. There’s hundreds and hundreds of photos, and 2008 values that are arrived at through a committee of people. If you have that book at a farm auction, and there’s a gas pump, you can avoid doing a foolish thing and buying a 400 dollar gas pump for 1000 bucks, or you might buy a 1000 dollar one for 400. There’s other books too, about specific brands like Texaco or Mobil. There’s a book called Guide to Gas Pump Restoration, which has a step by step for taking them apart and putting them back together, and three different sections about three different styles. It has 1100 pictures of different pumps for different brands and different grades of gas. And it shows how they were painted, two toned or three colors, and what kind of globe went on them. So if you want to be historically accurate, you could buy that book. Finally, go meet people at a swap meet or online, and get some experience, let them be a resource to you. New collectors typically start out buying the common items, and experienced collectors have those items sitting around. So you ask, and they can sell it to you for a reasonable price. Finding those people is the challenge. But going to swap meets is a great education. Take notes on what’s being offered, and ask questions. Just about every dealer at a swap meet is also a collector, and they love to talk about it. So ask them ‘how can I recognize this’ and ‘why is this one 300 and this one’s 30?’ If they’re not busy, most of them will tell you. Petroliana collectors are a great cross section of people. On our website, we have people all across America, and people in Australia, a lot in Canada, and some in Europe and other countries, and by and large, they’re great people who help one another. There’s a few nuts like there are in anything, but generally, they’re great people. I love that part of it as much as dealing with the things. Having the relationships with other people is great. Sam Baker, Collector of Petroliana and Vintage Ford Cars and Signs The VW Bug's Rare and Quirky Czech MateThis 1959 Goggomobil Is Insanely Cute and Gets 55 MPG. Why Can’t Detroit Do That? I have an online store (Kootenai Keepsakes) where I sell unique home decor accents. I like to put a short historical blurb about the history and/or legends behind each item. I cannot find any history on the Polly Gas Company (other than it was established pre-1930, and was an independent based in California). Can you tell me where to look for information on that company? I would really appreciate it if you could point me in the right direction. 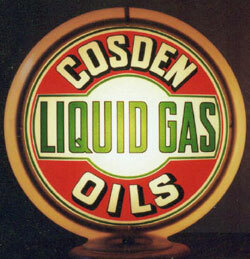 Norma: A brief history of the Wilshire Oil Company (Parent company that sold Polly Gsoline) is included in the book by Benjamin & Henderson called “Gas globes, Amoco to Mobil” on page 172. ISBN #0-7643-0668-5. Mary: If you want to find people that collect Petroliana, go to the web site http://www.oldgas.com/forum/ubbthreads.php?ubb=cfrm and post your needs/wants. If you just need information, check out the two publications mentioned in the above article. Maybe you can help me put some type of value on a old utilty can i have. what would you suggest I do if I was wanting to sell this bottle….? I have a Texaco Outboard Motor Oil glass bottle.. it’s green. SA-40 Made in USA. One US Pint. Has 2 oz measuring lines on the side… from 2 oz– to — 14 oz. plus more writting about this oil being used for other size small engines. I just broke a sugar bowl that my mother got for buying gas in the 40s. I have the rest of the set and would like to find another sugar bowl. It was a brown ceramic sugar bowl with a floral pattern of gold orange blue and white. Do you know what I am talking about and what it is called to I may look for another one. Is this rare? I have a glass gas pump globe that says Foster Superethylene Gas company. Hi….I have two original restored gas pumps in my store.. plus quite a lot of 50s and 60s items…this ranges from Elvis to coca-cola to the gas pumps….and everyone including my state health inspector tell me that these pumps are worth over 40,000.00 ….but yet how do I find someone that wants these items?….I am not selling cause I need the money. I am thinking of selling because I am a franchise and they are making me remodel. However the money would be nice too. If you can give me any advice on this please email me. as to what something like this may be valued at. It is in pretty good condition. Thank You for your help. and if this sign has any value? I came across what appears to be a one gallon metal can with a Cream City Logo on it. The label has a green background and in the center of the rounded A shaped label reads Cream City. The spout on top of the can is about 2 1/2 inches long and narrows from the can to the end. The cap on top of the can is approximately 1 5/8 inches in diametyer and is Stamped, not printed, Cream City. I know nothing about this can and would appreciate any information as to the age and its use. sinclair green Deisel #2 no glob or hose pump and moter sill inside What is it worth? 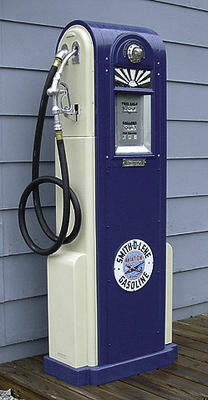 Most Tokheim 39 gas pumps are worth $350 to $450 in complete, unrestored but good condition. There are a couple model 39 pumps worth more, but they are rare variations. To know for sure, post your question and a picture on the Oldgas.com Shop Talk forum. You can also buy/sell there for free. I have a cylindrical aluminum first aid kit with a red plate stating First Aid Kit designed by Standard Oil (California) patent pending. I can only find one online in a petrolia memorabilia shop on Yelp.com but it is slightly different in that it states it is “manufactured” by Standard Oil. Inside this canister is an orange canvas first aid kit with medical contents from E.D. Bullard Co., can you tell me anything about this item? Can you help with some history and value please? i have a 1944 texaco salesman kit.. it has all the tubes. some are evaporated due to the ago of this item. i does have the original salesman manual. black leather case with a red velvet inside.. this is an awesome little kit..
can you help with some history of why texaco made these and how long these was used by their salesman.. also a value of the item.. The only info I have was the oil was used in oil based paints. Any info would be appreciated. I have a set of eight oil bottles in a chrome rack, they each have the Master Oil MFG. Co. Litchfield Ill. Sept. 14, 1926 spout with caps. The bottles have red and black logo HEP as a registered trademark and Imperial Refineries Clayton, MO. below it. What is the value of this set?? Hi folks, I have a question for anybody that maybe able to help me. Im building a replica 1933 ford v8 highboy roadster that raced at Elgin Illinois won by Fred Frame. All was going well and I intended to reproduce it faithfully as per one of those cars that raced there,UNTIL, this passed spring I went to Carlisle in the spring swap meet and fell in love with the Polly gasoline bird logo. Big dilemma, I would love to use the bird logo on my car as part of the body is going to be vineyard green with apple green wheels and colours would look really good. So hear is my Question , does anybody know if polly gasoline actually sponsored a race car in any race, such as the Gilmore cup in 1933 in Los Angeles or, held there own race anywhere? I would like to keep some form of authenticity to the sponsorship logos on this car, but that bird has really got me in. Mind you not the first time I have fallen for a bird [ nickname for a women down hear in Australia] and those have only gotten me into trouble, heres hoping that wont happen this time. Seriously I hope someone can shed some light on this for me. I have an old Harley Davidson oil can square one gallon. I have only found one other online and it tells nothing about it, only says “very rare”. After reading your article I believe it would be around 1940 ish….. just wondering what it might be worth, it maybe for sale….. Thanks for your time. Hi….I have a board game teaching aid called The Story of Oil from the Public Relations Dept. of the Standard Oil Co. of CA. There is no zip code on the box, therefore it is pre 1968. It has a ‘Graphic Display Box (a visual story of oil, the world’s principle source of energy), Activity Handbooks (incl materials for experiments), and is A Learning Experience (about crude oil–origin, discovery, production and transportation)’. I have been unable to find anything on this and wonder about it’s value. Ever heard of it, or know where I might look for information? So far, you’re the closest I’ve gotten. Thanks in advance for any help or information you might have.